Net administration is a field that is in a constant state of motion. Every year administrators not only have to juggle hundreds of different concerns, they also have to learn new skills for the future. Our networking needs are evolving at such a rapid rate that administrators are forced to keep up-to-date on all current developments. Over the past couple of years, we’ve seen the emergence of technologies like cloud computing and distributed networking environments that have added a new layer of complexity to the traditional network setup. 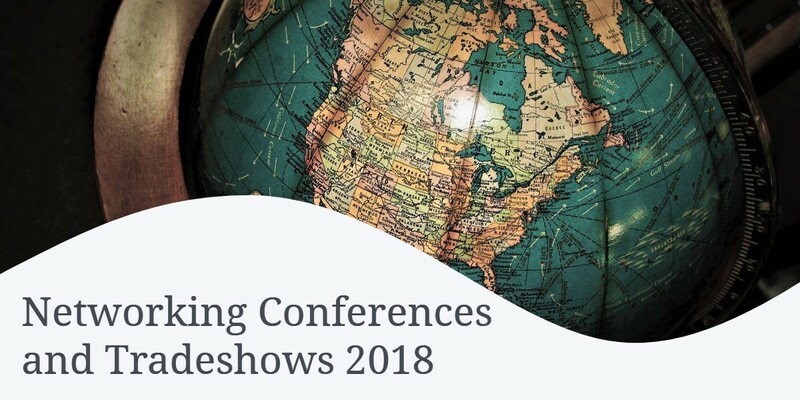 On this page, we’ve provided you with a list of networking conferences and tradeshows you don’t want to miss this year! Next we have the Gartner Catalyst Conference. If you require a top-notch look into the world of digital transformation and incorporating cutting edge technology into your business, then this is an event you need to attend. With over 50 sessions, 15 exhibitors and 600 attendees this is a chance to get up close and personal with some of techs most provocative topics. There will be sessions on cloud native architecture, datacenters, containerization, IoT, AI, machine learning, and security. SREcon 18 is an event designed for visitors to learn about systems engineering and distributed systems. This event has a clear professional purpose, to help visitors to develop their fluency with a diverse range of technology. Talks include Data Protection Update and Tales from the Introduction of the GDPR to Migrations Under Production Load: How to Switch Your Database without Disrupting Service. There is plenty for you to learn from this year’s SREcon! Jenkins World is the go-to event for system administrators who want to learn about the open source automation server, Jenkins. This year will feature over 2,500 visitors and over 100 workshops detailing everything you could possibly need to know about this service. While the event leans more towards DevOps there is still a lot to be learned. Talks include Continuously Deploying Applications to a Kubernetes Cluster and Scaling Network Connections from the Jenkins Master. IP Expo Nordic is an IT conference covering a wide variety of exciting areas of technology. This two-day conference will have seminars and exhibitions on many areas relevant to network administrators. Content is on cloud services, IOT, network infrastructure, data and analytics, to Devops and AI which will help to boost your knowledge of these crucial areas. Attendees will view presentations from the likes of Google, Amazon Web Services (AWS), Cisco, Wolfram Research, Oracle and Splunk. If you’re looking for a conference that delivers cutting edge industry knowledge to sharpen your services then this is the event for you. As one of the leading pioneers of modern computing, Microsoft is a brand that is hard to ignore. Microsoft Ignite boasts a range of talks and workshops you can use to build your expertise. You even have the chance to pick yourself up a new certificate along the way! The agenda has everything from material on Microsoft Azure AI, building hybrid cloud solutions and a SharePoint and OneDrive security/compliance masterclass. Microsoft Ignite also has a Diversity and Tech Pre-Day to provide IT talent with practical advice for career development alongside two workshops, a “Power Lunch session”, and a reception to close. You can attend the Pre-Day Workshop for $199. Even if you’re not a fan of Microsoft, its infrastructure is still very relevant to modern networks, so it is imperative to stay informed about the latest products. Cyber security is an area that network administrators simply can’t ignore. Cyber Security Chicago is an event dedicated to all things cyber security to help you stay protected against the latest threats. You can enjoy over 100 seminars from over 60 exhibitors geared to teach you cutting-edge best practices. Seminars include Do you know your vendor dependencies? and discussions led by George Beebe, Director of Intelligence and National Security at the Center for the National Interest. PuppetConf is an event that focuses on DevOps, cloud services and automation technology that kicks off on October 9th in San Francisco. On October 10th the event continues in Sydney and Amsterdam. This a 24-hour event and will be shown virtually as well via a live stream. The event is still accepting proposals from speakers but the schedule will include talks on how to scale DevOps, cloud management, and application delivery. The official agenda will be released in early August so we recommend that you check regularly to get the final details. Gartner Symposium’s agenda features talks on: Application modernization, business intelligence and data analytics, cloud computing, cost optimization, customer experience, digital transformation, platforms and strategy, emerging and advanced technologies, enterprise architecture, I&O Modernization, Innovation, Leadership, Security, and Risk and Work, People and Culture. This event has placed particular emphasis on providing attendees with inspiration and practical solutions to help them improve the way they use technology on a daily basis. While it doesn’t focus on a niche area like cloud computing, it offers a compelling breadth of topics and exhibitors to keep you busy. IT/Dev Connections 2018 offers over 200 sessions with technical training for IT professionals and developers. This year’s IT/Dev Connections has been divided into five Technical Tracks: Cloud and Data Center, Data Platform and Business Intelligence, Enterprise Collaboration, Enterprise Mgmt Mobility and Security, and Development and DevOps. There are plenty of opportunities to network with other professionals as well, with a mixture of pre-conference workshops, welcome reception, breakfast, lunch, and breaks every day. This also includes a Women in Technology luncheon. Throughout the three-day event watch out for talks on AI, app migration, containers, big data, monitoring, and data security configurations. The System Admin conference is a conference aimed towards system administrators and tech professionals. There are two days’ worth of sessions, each of which is 60 minutes in length. You’ll have the opportunity to learn about new technology trends and open a dialogue with some of the world’s leading tech minds. The conference offers attendees free wifi throughout their stay. Oracle OpenWorld is an annual event that provides attendees with information on topics such as eCommerce, cloud services, big data analytics and security. With a mix of sessions and hands-on labs, this event offers you opportunities to build both your theoretical and practical knowledge. This year there will be more than 2,000 educational sessions and exhibitions delivered by over 400 partners. LISA is a conferenced targeted specifically at network administrators or IT professionals. This conference is supported by names such as Google, Azure, Cambridge Computer, Bloomberg, and Squarespace. This year LISA will include a variety of talks, training, panels, and vendor-driven demos to help administrators acquire new knowledge. There is a range of topics being covered but administrators are most likely to be interested in the Architecture topics. These include: cloud computing, containerization, machine learning/AI, big data, IaaS, scalability, infrastructure design and performance planning. Web Summit originated in 2010 and has since become one of the largest technology conferences in the world. Web Summit boasts a range of exhibitors with names such as Google, IBM, AWS, Accenture, Cisco, and Microsoft making an appearance. Lisbon offers a great setting for you to learn more about the latest technology. Purchasing a full attendee ticket will grant you access to the event as well as other Web Summit satellite events and Night Summit parties. DevOps is a two-day event that will take you deep into the depths of DevOps. You will be able to view presentations from some of the true thought leaders of DevOps today. Architects, Developers, Engineers, Executives and Managers are just some of the conferences visitors making this an excellent opportunity to network with others in your industry. This year’s talks include Transformation Leadership and DevOps – Beyond the Research and Starting and Scaling DevOps in the Enterprise. If you’re looking to attend a conference that thoroughly explores cloud services, re:Invent 2018 is a conference you should definitely attend. Industry leading AWS experts will be heading the charge with workshops to talk through various technical concepts. The agenda includes AWS Certification Exams, hands-on labs, and bootcamps designed to enhance your core competencies with this software. In total, you will have access to more than 2,000 technical sessions and post-conference events. Purchasing a conference pass grants you access to all presentations, hands-on labs and the Developer Lounge. Content has been tiered so that beginners and experts can find something according to their experience level. Sessions are divided between introductory, advanced and expert. If you can’t make it to re:Invent then it might be worth considering streaming the keynotes from home. Check the re:Invent website for this information closer to the event launch. Next up on our list we have KubeCon. KubeCon brings together tech wizards from the cloud service and open source application communities. This year’s event features names such as Kubernetes, CoreDNS, NATS, Jaeger, Prometheus and Fluentd for three days worth of knowledge on cloud computing. Current items on the agenda including Building a Secure, Production Grade Kubernetes with Ubuntu, Free Kubernetes 101 Workshop for the Enterprise w/VMware and keynotes such as Cloud Native CD: Spinnaker and the Culture Behind the Tech. If you spend any amount of time with cloud services then KubeCon is a conference that you just can’t afford to miss. AWS Global Summits are free events driven by Amazon Web Services that allow visitors to learn new things about AWS. Even if you’re not currently working with an AWS cloud-driven service there is the possibility you will be in the future. This means it is a good idea that you boost your knowledge of this disruptive provider. The events include technically-driven presentations such as demonstrations, workshops and labs to build your practical knowledge of AWS products. DevOpsDays is a well-known series of conferences that started in 2009 and focuses on software development. This year sees dates in Amsterdam, Minneapolis, Indianapolis, Santa Maria, Shanghai, Dallas, Berlin, London, and Cape Town to name a few. All events are run by volunteers and feature a variety of presentations and talks. These include topics such as automation, testing, security and organizational culture. These conferences are particularly compelling because they are organized by local players. This means that you never know what to expect when turning up to a DevOps Day. If you’d like more information about an event in your area then check the website for further details. Now that you have the conference names, make the most of the opportunity and get yourself tickets! All of these conferences offer a great opportunity to learn more about their respective topics and boost your skills. Whether you are a battle-tested network administrator or an IT professional there are always more things to learn. At all of these events, you will have ample opportunity to learn and network with like-minded people. At the very least staying on top of innovations from firms such as Microsoft and Google will leave you in good stead for the future. Taking a few minutes to book a conference can help to influence your career in a positive way. If you want to attend one of these conferences then you may be able to get assistance with funding from your employer (particularly if the content is relevant to your day-to-day skills). By taking the time to commit to learning about all the latest insights and gear, you can begin to improve your skills. The beauty of disruptive technology is you never know what is going to happen until it does. By learning about lucrative new technology like machine learning you’re building your knowledge so that you’re not caught off guard when you need to monitor a new application or service in the future.